Celebrating 60 years? 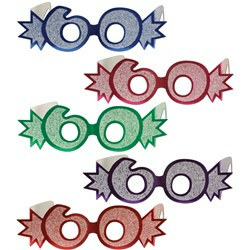 Why not wear these Assorted "60" Glittered Foil Eyeglasses to honor this special day. The glasses are made of glitter foil coated cardstock. They are sold in the assorted colors of blue, cerise, green, purple, and red. Sorry, specific colors cannot be requested. The Assorted "60" Glittered Foil Eyeglasses fits a full head size. Sorry, due to hygiene related concerns this item is non-refundable. One Assorted "60" Glittered Foil Eyeglasses per package. Not quite what was expected, but fun nonetheless.